Cleveland's Tremont neighborhood is home to the largest concentration of historic churches in the country. Located just south of downtown, the area was settled in the early and mid-19th century by central and eastern European immigrants who brought with them their customs, culture, and religion. Many of the churches they built still thrive today. Tremont, bounded by Starkweather, W. 14th, and W. 11th Streets, has enjoyed a renaissance in the last decade. New condos, restoration projects, and a myriad of restaurants and art galleries have made the neighborhood one of Cleveland's most desirable. Still, Tremont respects its history. The churches in the neighborhood range from Greek Orthodox to Lutheran to Polish Roman Catholic. These churches' onion domes and tall spires are a highlight of the Cleveland skyline. One church, St. Theodosius, was even featured in the 1970s movie, The Deer Hunter. A walking tour of nine of these churches is an easy two-mile stroll. Join me for a tour of Tremont's historic churches. We start just south of Starkweather on E 14th St. The congregation of Zion UCC dates back to 1867. Originally called the German Evangelical Protestant Church, they moved to the present location in 1885. The 75-foot church seats up to 1500 people and is noted for its 175-foot steeple. Services here were held exclusively in German until 1916 when one weekly English service was added. Today, Zion UCC is noted for its music program and community outreach. Inside, the pews, wainscoting, and woodwork is made of golden oak. Two original Tiffany windows flank the historic Ferrand-Votey pipe organ -- one of just three in the United States. Pilgrim Congregational UCC has a long history of community service. It was the site of Tremont's first library, its first kindergarten, and its first Boy Scout Troop. Today, it continues to involve itself in the community with theater and music programs. The first Pilgrim Congregational Church building, at W. 14th and Jennings, was sold to St. Augustine Catholic Church. We'll come to it a little later in the walk. Directly across the street from Pilgrim Congregational UCC is St. George Antiochian Orthodox Church, a church of the same faith that includes Russian and Greek Orthodox churches. The heavy stone structure was originally the Lincoln Park Methodist Church. Of Romanesque design, the church was built in 1892. St. George added small onion domes to the base of the steeple when they took over the structure. St. Augustine is just down W. 14th Street from St. George and Pilgrim Congregational UCC. The parish occupies the original Pilgrim building, which they sold to St. Augustine after their current building was completed. The red brick church, built from 1865 to 1870, is an excellent example of Victorian architecture in the Western Reserve. The parish is noted for its hunger and community outreach programs. Continuing down W. 14th Street, you come to Holy Ghost Byzantine Church, a striking church and a Cleveland historic landmark, built in 1909. Continuing on W. 14th Street, at the very end of the road meets the highway, sits the Greek Orthodox Church of the Annunciation. This stylish church, built in 1912 was the city's only Greek Orthodox Church until 1937. Today, it is an active parish and home to the Greek Heritage Festival, held each Memorial Day weekend. From the Church of the Annunciation, turn left and head three blocks to Professor. Turn right and head back towards Lincoln Park. You'll pass a nice assortment of galleries and restaurants on your way. After walking about four blocks, you'll come to St. John Cantius on the right-hand side of the street. St. John Cantius Catholic Church, built in 1925, is the heart of Tremont's Polish community. Services are held in Polish, English, and Spanish. The parish is also the site of the neighborhood's Polish Festival, held each Labor Day weekend. From St. John Cantius, turn left on College St. (St. John Cantius sits at Professor and College) and continue two blocks to W. 7th St. St. Peter and Paul Church, built in 1902, sits at that intersection. The yellow brick church originally had a single tower with an onion dome, but the dome was replaced with a bell tower during a 1956 renovation. From Sts. Peter and Paul, follow 7th St. until you get to Starkweather. Turn right. St. Theodosius is in the next block on your left side, but you'll see it as soon as you turn. St. Theodosius Russian Orthodox Cathedral, built in 1911, is the oldest Orthodox church in Cleveland and a fine example of classic Russian orthodox architecture. 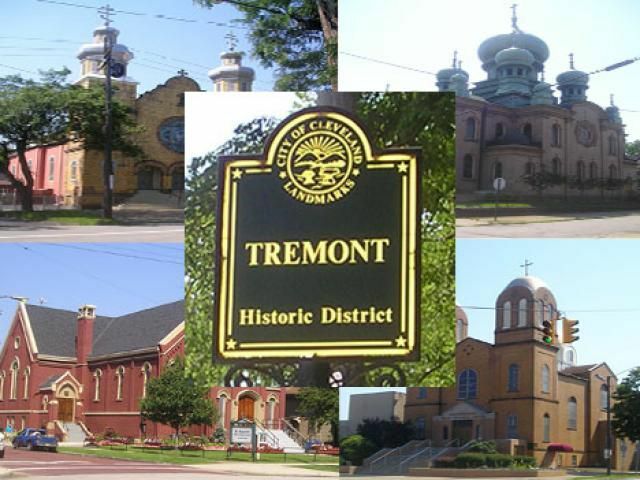 The cathedral's onion domes can be seen throughout Tremont and the near west side. Since December of 2006, the church has been lighted at night and can be seen throughout Cleveland's center. St. Theodosius is perhaps best known for its appearance in the 1977 film, The Deer Hunter with Robert DeNiro and Meryl Streep. St. Theodosius Cathedral is listed on the National Register of Historic Places.